Save 72% ! We are closing our Store and only have limited quantities of this book remaining. A special price on a great gift for new graduates, beginning teachers, returning teachers, and anyone who needs a shot in the arm after a challenging year! 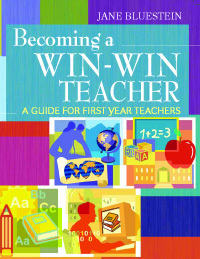 Becoming a Win-Win Teacher examines some of the challenges of becoming an educator in today’s fast-changing world. With practical ideas and honest cautions, this book encompasses a wide range of helpful topics including an exploration of what keeps so many schools rooted in win-lose philosophies and practices, personal assets that will increase the odds of your survival and success, and specifc strategies for winning in a win-lose system. Becoming a Win-Win Teacher will help you become a welcome, established, and effective member of a school community—without sacrificing your personality, intentions, or ideals. For people entering the field of education today, whether straight out of college as a first career, or mid-career switchers coming to education later in life, with topics and tips relevant and helpful for veterans as well—especially those working in a lead teacher, support provider, or mentor for newcomers to the classroom. The book includes handy charts, self-assessment surveys, planning pages, and activity sheets. For all grade levels and for anyone working in a school setting, this book is also a great resource for college professors and seminar or study group leaders. A great companion book to The Win-Win Classroom and a wonderful gift for student teachers and recent graduates. Use your credit card or PayPal account to order Becoming a Win-Win Teacher through a secure server online. Ask for an autograph. It’s free, too! Effective ways to manage student behavior, build your support team, connect with kids, learn the system, and grow your career. For new teachers and veterans, all grades. Save 72% on a great gift for new graduates, beginning teachers, returning teachers, and anyone who needs a shot in the arm after a challenging year! Product page. Products are listed alphabetically.